The unveiling ceremony at Church House. Left to right: The Lord Mayor, the Bishop, Paul Martin, Peter Scott-Presland. On 7 October 2014 CHE celebrated its 50th anniversary, in a series of events organised by the Lesbian and Gay Foundation (LGF). 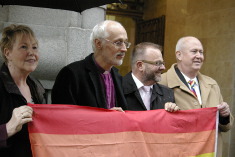 The Bishop of Manchester, together with the Lord Mayor, unveiled a plaque outside Church House, Deansgate, Manchester, where the first public meeting of the North Western Homosexual Law Reform Committee (NWHLRC) had taken place on 7 October 1964. In the afternoon, representatives of CHE and the local LGBT community were entertained to tea by the Lord Mayor in Manchester Town Hall. There were speeches from the Lord Mayor, the Bishop, Paul Martin (Chief Executive of the LGF), Peter Scott-Presland and others. The Bishop paid tribute to Ted Wickham, who had been his inspiration in the area of industrial chaplaincy, and as Bishop of Middleton had facilitated the early meetings at Church House. 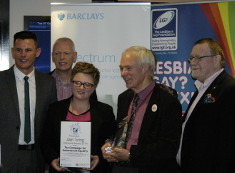 And in the evening during the annual Homo Heroes Awards ceremony, organised by the LGF, CHE received the Alan Turing Memorial Award 2014.